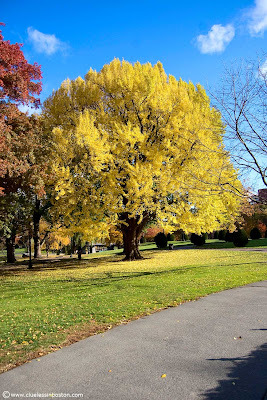 Colorful tree in the Boston Public Garden last week. so close by in miles yet so far in climate. It's difficult for me to believe that it is still that warm there! There is still so much foliage on the trees? Amazing. Things are quite bare here and had been for a couple of weeks. how many wows for this image?! beautiful colours! What a glorious photo you have here of one of nature's gifts to us. Thank you. You have more leaves than we do...ours are empty after our rain and wind last week.